The Magic of Stories | Take a break from the real world and enter one of escapism. I’m Kazz Mossman and the reason I started this site was because I love stories. Stories are all around us. Stories weave the pathway to our lives. 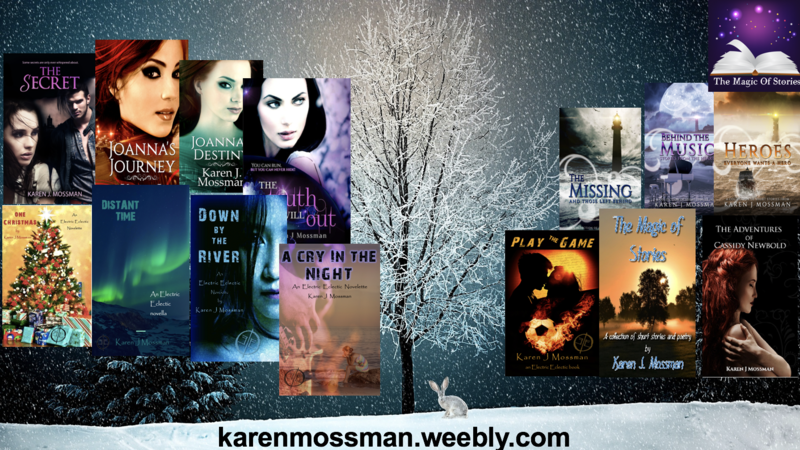 I’m also an author and go under the name of Karen J Mossman. These are my books. If you want to know more pop over to my website. Magic of Stories is all about those tales that intrigue us, the true stories, the chit-chat and articles. Fiction still plays an important part, and most fastinating of all, a step back in time. I love history and have been collecting snippits to share, bacause they are sometimes the most fascinating of all. In 2016, I moved from the big city of Manchester to a small island of the north Wales coast. Island Life is where I tell you what it is like to live here in such a glorious place. Choose from the menu where you would like to go and Magic Posts is the main blog where you will find the up to date posts. Cassidy Newbold talks to the dead and they have some interesting conversations. This is a compilation of short stories which I add to now and again. Visit Cassie’s page for more details. The link to sign up for your mailing list isn’t working. Please let me know when it is. I would love to get your updates! Sorry about that. Can’t get it to work either, so I have added a form. Please add your name to thank. Thanks! Thank you, Karen, for following my blog SCAN today! I appreciate your visit very much and I look forward to reading more of YOU also. Hi Lynda, I only just found this in my ‘pending’ to confirm. I’d forgotten what Scan was and went over to check. I liked what I saw, so confirmed. Always nice to find interesting places. Do you mean the form for the mailing list? I just filled it in and it sent. Thanks Jane, it’s a pleasure to host you. 3rd time lucky, hopefully !! Quite interesting to read that your 2x great grandfather wrote for the Oldham Chronicle As you probably remember, both my parents originally came from Oldham. I have a copy at home of the 1st issue, 1st edition of the Oldham Chronicle which I found when clearing out after my dad died.Pity it wasn’t an original or it would have been worth quite a bit. Even so, I expect it has some really interesting snippets in it. What year is it? My 2xGG wrote articles for them and then published a book. I have the book, but can’t remember the exact date now. Early 1900s perhaps. In it he describes his visit to Henshaw’s Society for the blind, which I published on here. He also went to Kersal Cell in Salford, amongst others. It is interesting seeing it from his eyes and of those times. Shared this with the world… oh, you have been bacon tree’d, sorry I mean (H) ambushed! Thanks Lynne, glad you like it.